Even when you’re grieving and dealing with loss, you can also have sudden moments of clarity. On any given day you may be dealing with loss. It might be something devastating like the loss of a loved one. Or it could result from the unimaginable, like gun violence. Maybe it’s more imaginable (but still upsetting) like losing a job, home or relationship. Once the initial shock is over, experts have told you that you’re supposed to go through five stages of grief: denial, anger, bargaining, depression and acceptance. If you’ve been on this journey, you’ve probably noticed that the stages don’t follow each other so seamlessly. And that there really isn’t a typical response to loss or overcoming grief, so there isn’t a typical way to deal with loss. You might feel wildly angry, then numb, thinking this can’t be true. Then you’re weeping with the realization it is true and that’s followed by feeling guilt stricken. But then you’re temporarily hopeful and creating bargains to be better if only you could go back in time. It’s a rollercoaster ride minus the fun. This happens because your brain doesn’t have the tolerance for simple sadness. It doesn’t know what to do with it. On the other hand, your brain is an expert in inflaming anger, guilt, shame and fear. Have you ever noticed how hard it is to just be sad without it turning into anger, analyzing, blame and self-criticism? This moment of clarity is your heart stepping in and giving your brain a much-needed break. It’s the instant when you are right in the center of Heart and have tapped into its power. Being in Heart allows you the griever to connect with your sorrow and grief. It’s how you the griever settle in your sorrow and thereby become ready to move through it. Heart, unlike brain, doesn’t have an opinion about being sad. And I don’t mean your anatomical heart. I’m talking about Heart the way I’ve come to understand the collection of longings and abilities that don’t come from your brain. Tapping into the power of Heart is the secret to managing uncertainty, pulling through tough times, and allowing you to just keep going no matter the situation. Tapping into Heart will make dealing with loss easier because sadness is no longer a sign of weakness, doom or failure. Sadness is just sadness. It’s a sign that you’re alive and awake. Heart creates space for you to just be sad. And Heart, not brain, is where you can best tolerate painful emotions. 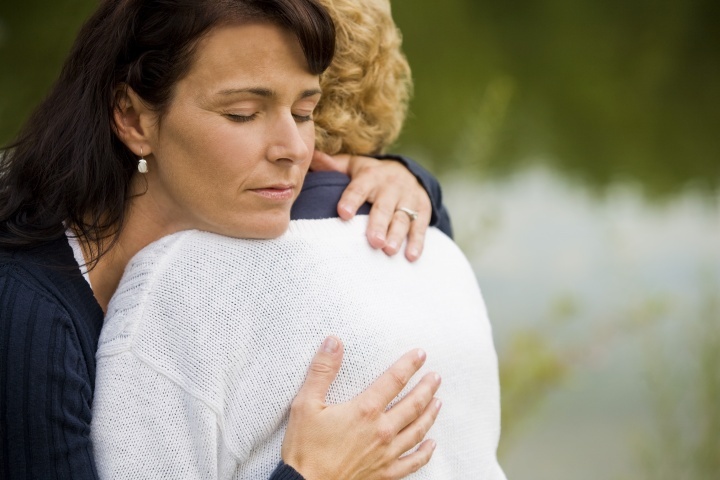 In my experience as a mother and a doctor, helping a griever settle in the center of Heart is how I offer help when dealing with loss. In the beginning of this process, moving into the center of Heart is often accompanied by a release of tears because this is where true sadness resides. Don’t fight it! There’s a reason why you feel better after a good cry. And although you can still feel pain when you settle in the center of Heart, you may also feel relief because Heart doesn’t just show you how sad you feel. Heart shows you how strong you are. Yes, you might be sad beyond belief, but you are also strong beyond your wildest dreams. Heart is strong and bold. Heart is your source of resilience, purpose and courage. When you tap into the unexpected power of Heart, you know that you can figure out whatever comes your way. And you know that you can deal with loss and grief. This is your reminder to tap into Heart. This is your reminder that even when you’re sad, you can still be Heart strong. Dr. Amy Bloch is a former brain-first devotee who discovered first-hand the unexpected power of Heart. But not your anatomical heart - Heart as the collection of longings and abilities that don't come from your brain. Tapping into Heart is your source of resilience, purpose, and courage, and Amy teaches people the Heart-first lessons and strategies she applies in her own life and professional practice. She is currently working on her first book about this that will be published by St. Martin's Press in 2019. To find out where you are on the Heart Strong spectrum take this short quiz - https://www.dramybloch.com/dr-amy-bloch-heart-strong-quiz/. You can also follow Dr. Bloch on Facebook at https://www.facebook.com/DrAmyBloch/.